A Week After Al-Qaida's Attack On An Ivory Coast Beach, Ivorians Return To Show They're Not Afraid : Goats and Soda A mother in Ivory Coast defiantly brings her children to the resort town where al-Qaida terrorists killed 19 people on March 13. A new music video reinforces her stand. 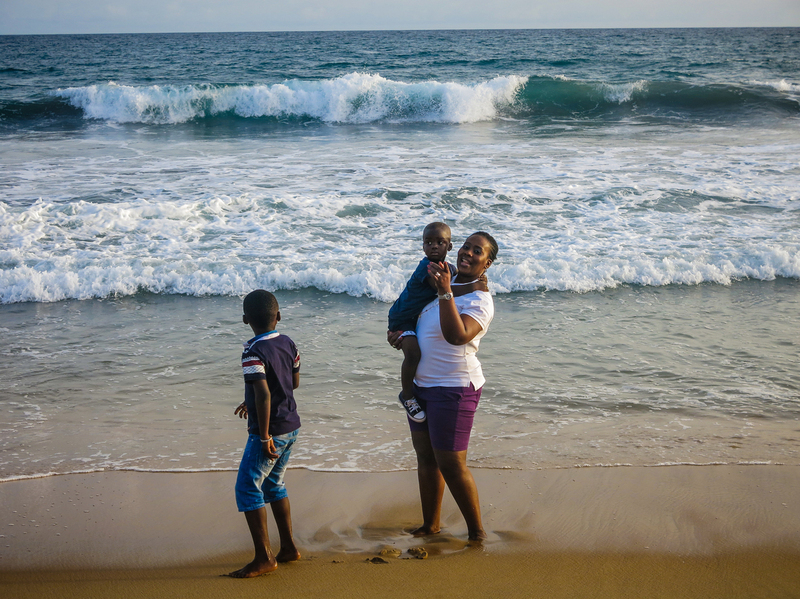 Salimata Sylla, a mother of three, visits Grand Bassam with her family to show she's not afraid of terrorists. On March 13, al-Qaida gunmen killed some 19 people at the beachfront town. "We're not afraid of the terrorists," says Salimata Sylla. The 40-year-old government worker, wearing purple shorts and a big smile, is visiting the historic Atlantic Ocean town of Grand Bassam, a UN World Heritage site. The seaside resort in Ivory Coast was, on March 13, the target of al-Qaida gunmen who attacked the Etoile du Sud and other hotels and the beachfront with bullets and grenades. They killed at least 19 Ivorians and foreigners. A week later, Sylla went to the beach with her two boys, Hassane Coulibaly, almost 7, his younger brother, Kader, who's 2, and their 14-year-old sister, Myriam, along with other family members. She wanted to make a point: "We're not afraid of those terrorists and won't stay locked up at home," she says. "Jamais, never, never, never afraid. Non. No, no, never afraid." Sylla says her work colleagues were horrified that she was going to the beach. "They thought I was crazy and tried to dissuade me," says Sylla. "When they realized I was serious, they said, "Well if you're determined to go ahead with your beach plans, go by yourself and leave the children at home." But she brought them and urges others to do the same. And she had plenty of company — dozens of beach-goers, including some other families, were on the scene. On the same day that Sylla and her family visited, a group of popular Ivorian performers gathered in front of the hotel to sing a song of defiance called "Meme Pas Peur." That's an Ivorian-French expression that roughly means "Can't Scare Us" or "We're Not a Bit Afraid." The musicians recorded a video surrounded by beach-goers dancing and singing along. The musicians call themselves Collectif Bassam — Bassam Collective — in solidarity with Grand Bassam. They recorded the track in the studio just days after the assault, then went to the scene of the attack to make the video. A drone flew overhead, filming dance steps and attracting attention and admiration from the crowd that joined in. The song is music producer Chico Lacoste's idea. He said he was inspired to tell the world: "Ivory Coast has been hit, but they haven't knocked us down. Ivorians will stand up and resist." The West African nation was once a regional oasis of peace and prosperity before a decade of political turmoil that culminated in a civil war. Ivory Coast often turns to music as a salve in times of crisis; Lacoste says artists readily cooperated in the joint release. Safiatou Traore, a local TV soap opera star, is part of the "Can't Scare Us" collective. She was dancing her heart out while the video was being filmed. "I love dancing. Ivorians enjoy having a good time, especially here in Bassam," says Traore. "Coming back to the scene of the attacks is the best way to tell the terrorists the people of Ivory Coast are strong and will not be cowed," she says. It's almost sundown at Grand Bassam beach. Salimata Sylla is gathering her kids together and preparing to head home. She makes a promise, "All the day, all the time, forever, I will come in Grand Bassam." Then, in an irrepressible expression of exuberance, she says, "I'm here and I'm alive," and, throwing her arms upward, shouts, "Oooooooooooooooooooh!"